I remember back in the mid-90s when I first found out that the SNES version of Dracula X wasn’t the only Castlevania game to have that title. In fact, it was basically like a dumbed-down version of a much better experience that was only released in Japan for the PC Engine (TG-16 CD in the US) in late-1993. Dracula X: Rondo of Blood is the 1993 prequel to 1997’s amazingly-popular, genre-defining game Castlevania: Symphony of the Night, set five years before that game’s events. It tells the story of Richter Belmont’s battle against the newly-revived Count Dracula, and even the SNES version was a real treat to play. The PC Engine version of the game is a much longer experience. The music is all CD-quality, the graphics are very crisp and vibrant, and the gameplay is dead-on with what you’d expect from a classic platformer in the series. What’s also very cool about Rondo of Blood is that you can play as Maria Belmont (another bigger character in Symphony of the Night), who brings her own strengths and weaknesses to the table…but only after you rescue her. In any event, my good friend Greg from Destroy All Fanboys sent me an email yesterday talking about a very limited fan-produced “special edition” of the game called Akumajou Draculs X: Belmont Survival Kit. 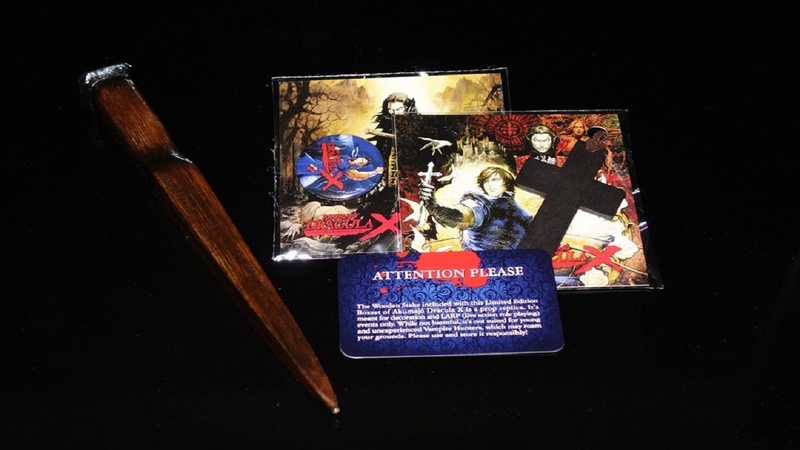 Produced by PCE Works, this special box set includes their digipack version of the game in an awesome wooden box with blue velvet lining, a replica wooden stake, a wooden cross necklace, a metallic sticker, and a Dracula X pin. All of this, though, is a bit costly, running at 219 Euros (including shipping). But, if you’re a big-time collector and a fan of the Castlevania series, this might just be worth splurging the money on. It’s a limited run, though, so act while you can!